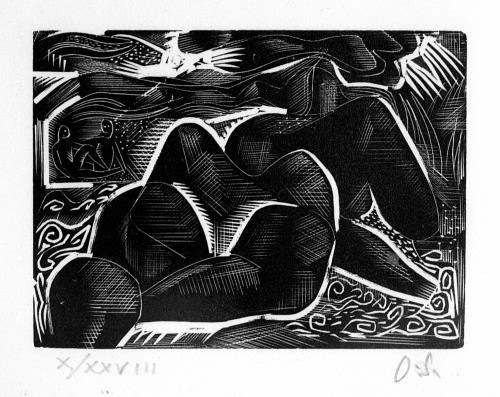 Linocut by Edwin Smith, signed by Olive Cook, editor’s collection. To this disappointment we must also add that of his widow, Olive Cook, in her efforts to posthumously promote his claims as an artist. 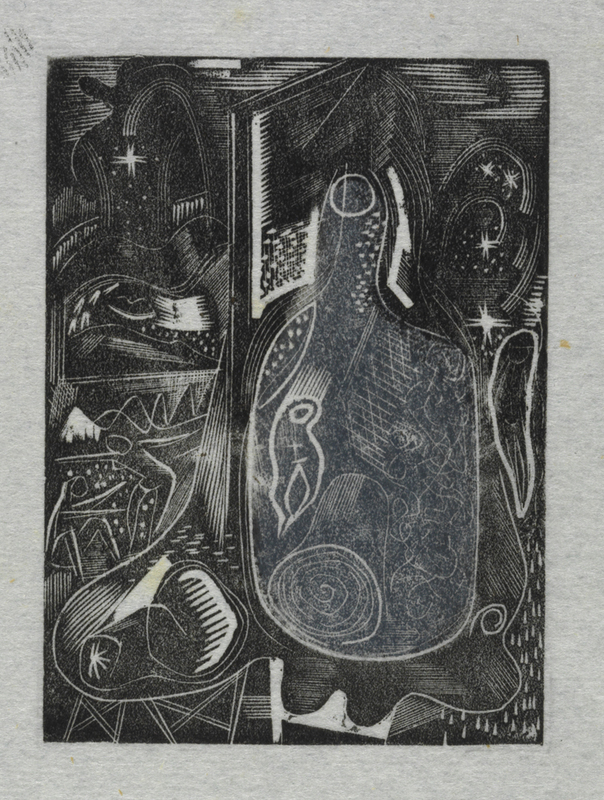 Olive, whose own life (1912-2002) was memorably recalled by Lucy Archer in Matrix 23, achieved more success with exhibitions of Edwin’s work, and also saw one small book to publication, but for the most part Edwin’s reputation as an artist still did not emerge. This can be attributed partly to conflicting demands on her time in curating the 60,000 negatives of Edwin’s work, and the continuous demand for them; by her own work as a writer; and by the inherent modesty that both of them had shown in their lives and achievements — few photographers were less concerned than he with expressing their own personalities as the RIBA commented at the time of an exhibition in 1985. Both of them were always reluctant to discuss their work. 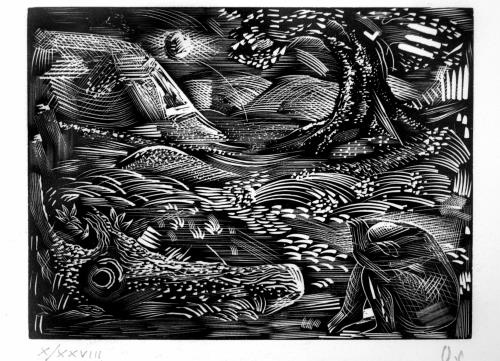 So it is that we find ourselves with little to go on when approaching Edwin’s engravings, save their self-evident skill, although here I am conscious of John Farleigh’s observation in The Studio, June 1942, that ‘a bad engraving looks better than a bad drawing’. 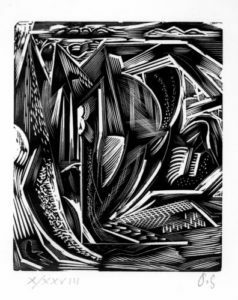 Significantly it is only since Olive Cook’s death that the full extent of his work in wood-engraving and linocuts has been revealed and that through the cruel conduit of a boxed lot in the studio sale. Typically, Olive had divided her estate between her many friends, and to the Fry Art Gallery in Saffron Walden, which she had assisted my wife in founding in 1985, she left all the framed works in her house, and a monetary sum. Appreciative though we were, we were still unaware of the amount of unframed work done by both Edwin and her, until the sale of her effects, when a torrent of drawings and watercolours was released. 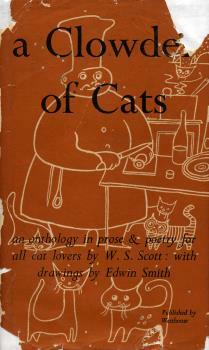 ‘A Clowder of Cats’, illustrated by Edwin Smith, editor’s collection. 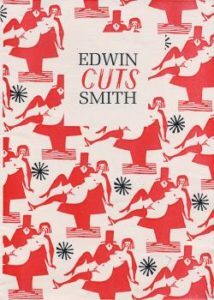 Among the lots was a box of cuts by Edwin, including many duplicates of the small editions that he would make, and some with pieces cut out where they had been used in Olive’s memorable collaged greetings cards that she sent to her friends. And so it is that the Fry Gallery has now, voluntarily, picked up the baton of promoting Edwin Smith as an artist. Faced with accessing items for the gallery’s permanent collection I went to what primary sources were available. The earliest is a short book A Small World, produced in an edition of thirty-two copies by Edwin in January 1969, and brought to my notice by Michael Taylor. But this contains no text, merely the engravings, some of which are published now, and of which the Fry Gallery has individual copies. 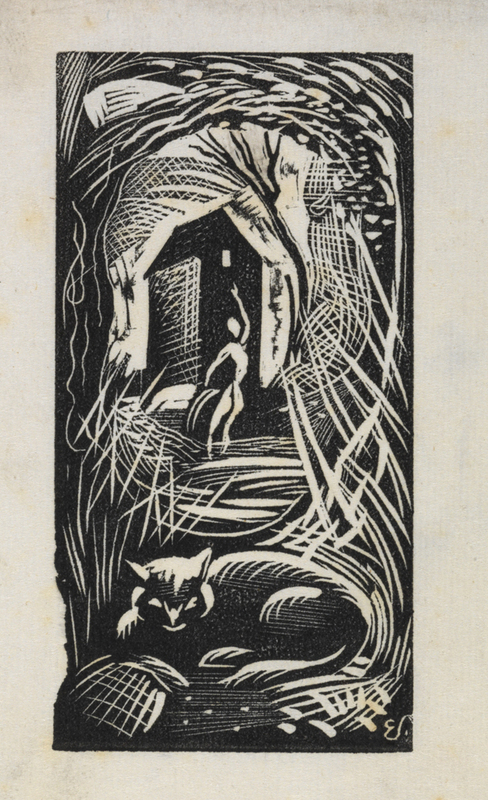 His other illustrated book – A Clowder of Cats – was published by John Westhouse in 1946, but contains linocuts, not wood-engravings. ‘Cuts’ by Edwin Smith, published by Previous Parrot Press, editor’s collection. 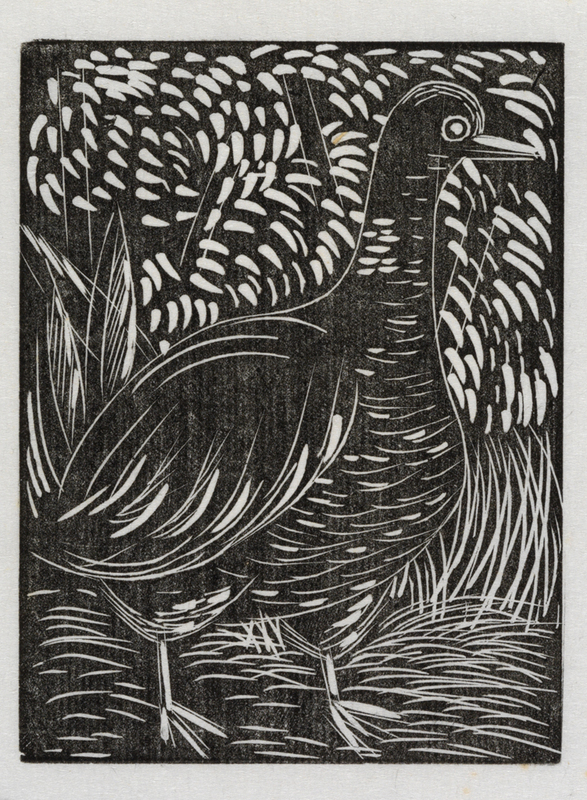 In 1989 the Fry Gallery staged a small exhibition of woodcuts, chosen and with an introductory sheet by Olive. In this introduction she explains that Edwin had made cuts throughout his life, learning first from books by Clare Leighton, and encouraged by his friend Enia Marx. 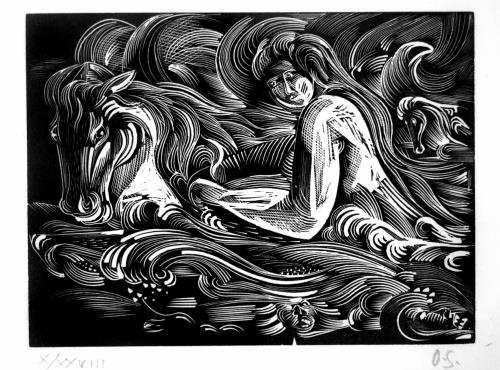 He began wood-engraving in 1934, at the age of twenty-two, and worked in this medium until 1939. 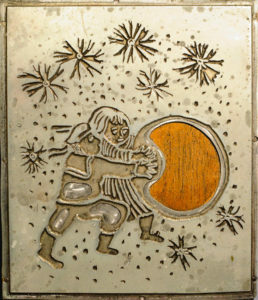 After this year he continued to make cuts, in lino, influenced by Claude Flight, and on a small scale, demonstrating an inventive and humorous view of everyday objects and sights such as a razor blade, lace trimming, or Schnabel playing Schubert’s Impromtus. These cuts are worthy of a separate article, and have already been made more widely known through the book Edwin Smith – Cuts, published by the Previous Parrot Press in 1992. It is from the six-page introduction to that volume by Olive that much else of what is known on the wood-engravings is derived, as well as from the contribution that she made in The North West Essex Collection (1988), reprinted in Artists at the Fry, edited by Martin Salisbury (the Ruskin Press and the Fry Art Gallery, 2003, seep. 158). 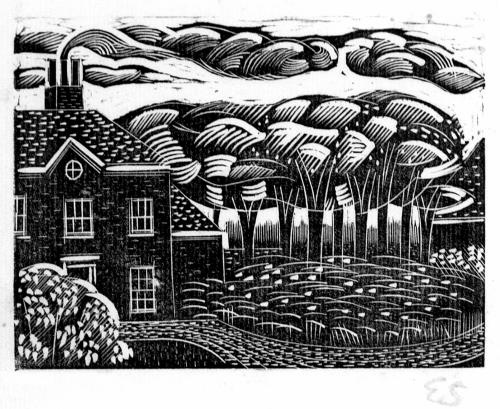 When Edwin began wood-engraving in 1934 he was still working as an architectural draughtsman, for which he had some training, although a year later he had begun to take photographs as a ‘profitable sideline‘, and engraving must have been one manifestation of his passionate interest in all forms of visual expression. 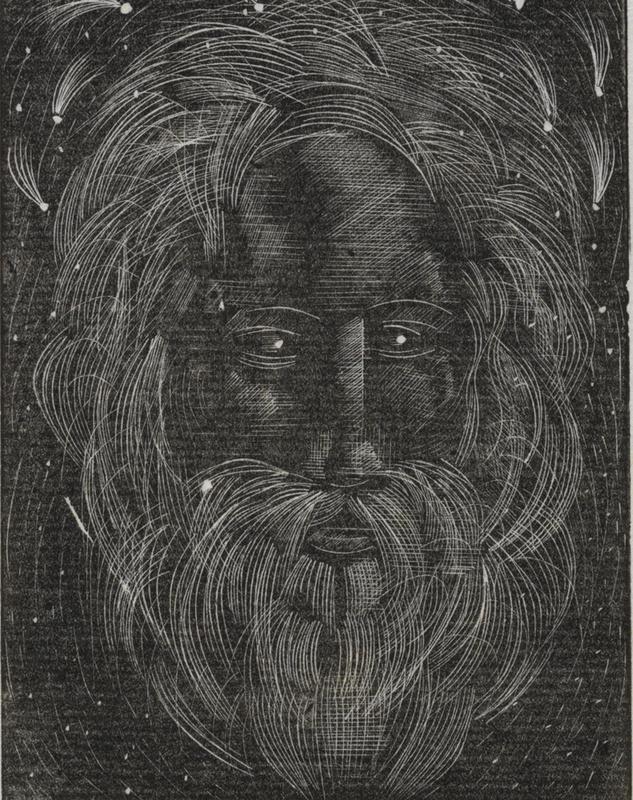 He appears to have stopped wood-engraving in 1939 before he met Olive, but it was she who witnessed a driven man, producing two or more works of art every working day, who would often execute a linocut in the brief interval between leaving the dark room and lunch, and then print it between tea and supper.The works hown here reveal the experimental approach of an artist eagerly exploring the possibilities of a new medium, and using the tools with a confidence and precision that is impressive. 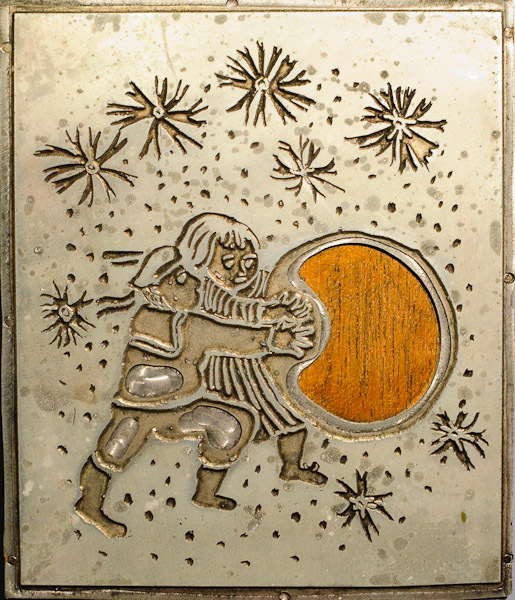 His techniques embrace grading blacks into whites, varying cross-hatched lines, and showing a preference for the very fine tint tool. 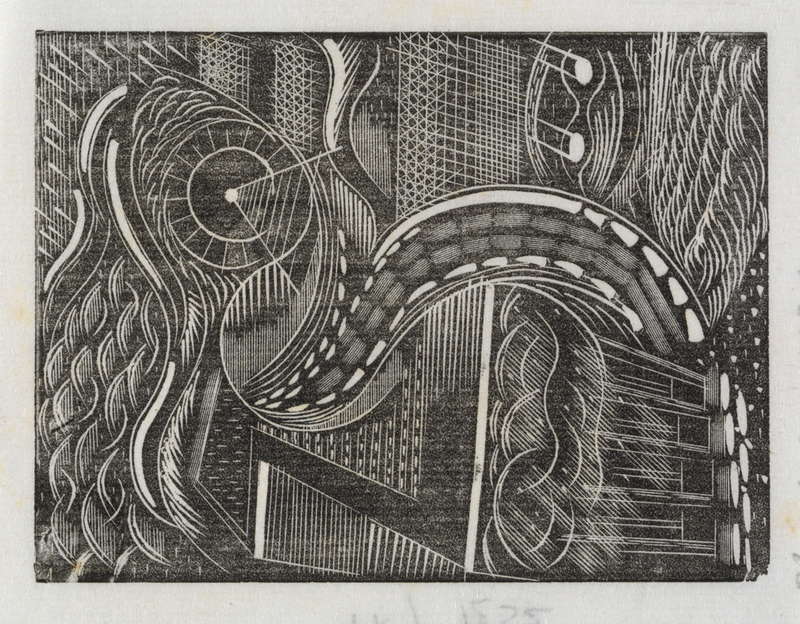 As did Paul Nash, a friend and fellow photography enthusiast, Edwin used woodblocks for repeat patterns. No individual commentary appeared alongside the engravings in either the 1969 or 1992 books, and none is attempted now, save to observe that in the examples illustrated here we can perhaps also see echoes of Samuel Palmer, Paul Nash and Eric Ravilious, as well as an artist standing firmly on his own foundations.